One would imagine a Chartered Accountant to be all about numbers and balancing the sheet……! One could be sure that he would be equally fixated about them while running. In a runners world full of numbers in personal bests, optimum heart rates, cadence, pacing, sub 1’s, sub 2’s and sub 5’s…….there are a few who run for the sheer joy and fulfillment it brings to the self. 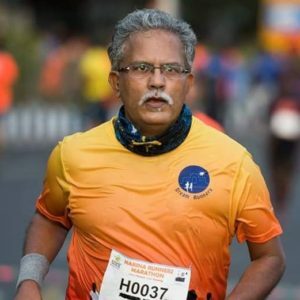 Team DR is proud to have in its midst Venkat Venkatraghavan, for whom running, apart from being for fitness, is a means to the concept of community! He will take in the surrounds of the locale, stop to smell the air, chat up with the locals, help a blind person across the road, choose to push a wheel chair co-runner and do the small little things which go to make this world a better place. A self-employed practitioner, his profession takes him across geographies in India and there probably isn’t a place where he has been and not networked with a local running group or runners to enjoy the weekend long run. He is well and truly the DR brand ambassador. Of his many outstation runs, fondly remembered are the trail run along Yamuna in Allahabad, Vadodara City Circuit Run over 6-7 bridges and at Kamatibaugh, Okhla Bird Sanctuary run in Noida and Banta Park run in New Delhi and the run around the lake and villages in Salt Lake. With the playlist on his phone playing Vividh Bharathi film songs from 1950s to 1990s of Hindi and Tamil, he does indeed travel back in time as he runs ahead…..! That he is an accomplished runner is of course backed up by the numbers…..! His personal bests are52:48 in Chennai 10K, 1:58:06 in HM at TWCM and 5:32 for the full. He has also played a big role in mentoring the OMR chapter of DR, the OMR Dreamers and many look up to him for inspiration. He is a valued member of the DR Trust and we hope we will charter a fruitful way forward with his experience and guidance.